Development of communities and society through social and community development responses. Most inspiring Corporate Social Responsibility arm. Lanco is deeply committed to fulfilling its responsibility as a corporate citizen. It believes in proactively involving communities and those deprived of fruits of development to be equal stakeholders in growth and development in locations that are close to its operations. It is for this reason that Corporate Social Responsibility (CSR) is integrated into the group's core business strategy and the Lanconians are encouraged to internalize this concept and use it in day-to-day work. Lanco Infratech Limited, a member of the UN Global Compact, is well recognized for its good corporate governance and CSR initiatives. Its CSR initiatives are led by the Lanco Foundation, the CSR arm of the Lanco Infratech, established in 2000 under the Indian Trust Act. The Foundation has been spearheading welfare and development activities in the fields of Education, Health, Safe Drinking Water, Empowerment of the Physically Challenged, Neighbourhood Community Development and Environment across 13 locations in 11 states of India. 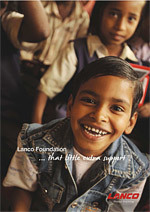 The Lanco Foundation is steered by a Board of Trustees, chaired by Mr. L. Rajagopal, the Founder Chairman of the Lanco Infratech Limited. Other members of the Board include Mr. L. Madhusudhan Rao, Mr. L. Sridhar, Mr. G. Bhaskara Rao and Mr. G. Venkatesh Babu. Mr. Suresh Chukkapalli is the current Managing Trustee of the Foundation.